70mm prints of "The Empire Strikes Back" differed from the 35mm version in that some editing differences, additional shots, alternate takes, and extra dialogue can be detected through a comparison of the two versions. It is understood that when the movie was considered "finished," the elements were turned over to the lab and sound facilities so the desired 70mm print order could be prepared. The filmmakers, however, elected to "un-finish" the movie and make a few, albeit subtle, changes that, considering the expense and time involved in re-striking and and/or re-sounding 70mm prints, were reflected only in the film's 35mm prints. There is a bit of irony in all of this trivia: the majority of the public and media who saw the movie in its first month of release saw the "less complete" version. The 70mm version of the film was substantially different from the 35mm version that was more widely seen. After the Probot lands and moves left, there is an optical wipe to the overhead shot of Luke on his Tauntaun. After Luke wanders through the snow and falls face down, there is an optical wipe to Han instead of a straight cut. The bacta tank scene starts on a close-up of Two-One-Bee and pans right to a closeup of Luke in the tank. It then cuts to FX-7 extending its arm to the tank. There is no cut to Leia, Han and Threepio observing. In the snow battle scene, when Luke drops into the snow after throwing a charge into the Imperial walker, the AT-ST in the background has no atmospheric depth. It looks too close and small. 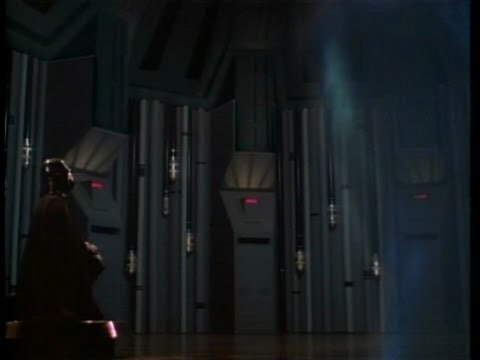 In the Emperor scene, the hologram of the Emperor is already present in the first shot-it does not "tune in" gradually. The Imperial fleet establishing shot after the magic tree scene has a different TIE fighter sound effect. 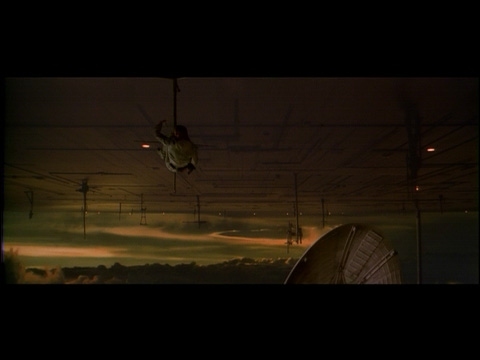 When Luke falls from Cloud City into the Millennium Falcon, the Falcon's radar dish is not added to the shot. The telepathy between Luke and Vader during the "Hyperspace" cue has straight cuts instead of quick dissolves. When Luke finally collapses in the snow, he lets out a grunt as he lands on his face. Han says "until I can get the shelter up" instead of "until I can get the shelter built." Luke says an additional "Ben... Dagobah..." just before Han says "and I thought they smelled bad on the outside." When C-3PO tells Luke "It's so good to see you fully functional again," Luke replies "Thanks, Threepio." The line "Headquarters personnel report to Command Center" is repeated three times instead of two. The line "The first transport is away!" is said in a different voice altogether. When R2 is being loaded into Luke's X-Wing, C-3PO says the word "and" before saying "do take good care of yourself." Han's line "Transport, this is Solo. Better take off, I can't get to you. I'll get her out on the Falcon" is followed by, "Come on!" In the asteroid field, after C-3PO says "Oh, this is suicide." He says, "There's no where to go." Luke says "You're lucky to get out of there" instead of "You're lucky you don't taste very good." Yoda makes a frightened "Ehhhhh!" sound just before Luke says "Like we're being watched" and points his blaster at him. Yoda says the word "Run!" before "Yes. A Jedi's strength flows from the force." The following lines "But beware the dark side. Anger, fear, aggression. The dark side of the force are they. Easily they flow, quick to join you in a fight" are also much louder and clearer. In Cloud City, after C-3PO says "That sounds like an R2 unit in there. I wonder if it..." he says "Hello?" only once instead of twice. Before C-3PO gets shot, a different voice says "Who are you?" While C-3PO is on Chewie's back when they enter the carbon freezing chamber, the line "Now remember, Chewbacca, you have a responsibility to me, so don't do anything foolish" is louder and heard more clearly. During the duel, when Luke knocks Vader off of the platform, Vader lets out an "ooooh!" instead of an "aaargh!" Lando's line at the end, "Luke, we're ready for takeoff." is a different take. In the final scene, there is no tracked music from "Yoda and the Force". Is any of the print scenes known or does it even exist in any form anymore. Would be cool to restore this version. I doubt that this could be restored precisely to the original, but we have a huge advantage: the SE's were based off of the 70mm tracks. I"m working on an alternate mix that uses the SE mix wherever possible. Is there a sound mix where the line "the first transport is away!" is missing, or did I imagine it? "A Jedi can feel the force flow through him". I think you imagined it.
.: Revenge of the Jedi 0.83 MS Edition :. "When R2 is being loaded into Luke's X-Wing, C-3PO says the word "and" before saying "do take good care of yourself." Funnily enough the "and" has always been there. It is just VERY low level. 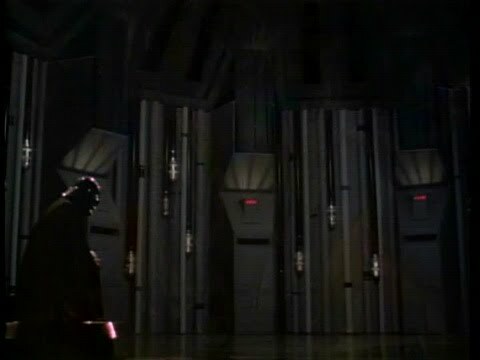 The Emporer does not fade in in his communique with Vader. Millenium Falcon Satellite dish not visible with Luke on weather vane. - Han saying 'watch this' as he tries to jump to hyperspace in the asteriod field. Although the dialogue hasn't changed different emphasis are put on certain words." - Cloud Car pilots - Different line - will confirm with actual line asap. - C3P0 - new line just before "I thought that hairy beast would be the end of me" - It's something like "I'm glad we are back together"
- The frigate at the end looks decidedly different - i will have to check this. Cloud City Security - "Any aggressive move will not be tollerated!" Cloud Cit Security - "Permission granted to land on platform 3-2-7. Any deviattion will" - Han cuts of comms. C3P0- "Get away from there, you don't know how to fix the hyperdrive! Excellent job on this, Pugs! This is an absolute must have! The above shot on the Super 8 reel corresponds with reports regarding the 70mm cut of TESB. 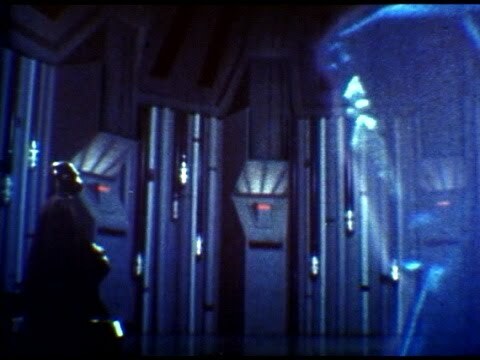 In the 70mm version, the Emperor's hologram doesn't fade in, just like the Super 8 reel. Again, this corresponds to the 70mm cut. I believe this is the first confirmed visual evidence of alternate footage existing within one of the films! In the final scene, there is no tracked music from "Yoda and the Force". The scene begins with the first establishing shot of the rebel fleet, then cuts inside the Falcon for Lando to say, "Luke, we're ready for take-off" (but a different take of this was used). After Luke says (voice over), "Good luck, Lando" the scene cuts to inside the rebel cruiser where Luke says, "I'll meet you at the rendezvous, " etc. Not in this version are two more establishing shots of the fleet and an interim effects shot over which Lando says, "When we find Jabba the Hutt and that bounty hunter we'll contact you." Add all of this to the numerous (and already known) differences in the Super 8 audio and this becomes even more intriguing. The German "marketing film" released 10 months after the cinema start in West Germany a cut version on Super-8 on two reels in 4:3/color/sound. Reel #1 is running 17 minutes (120 meters), reel #2 is running 9 minutes. This two reels are fitting together and are showing the story from the beginning of the movie to the end of the fight between the Falcon and the TIE fighters right after the escape from the Death Star. The assault on the Death Star didn't make it in this Super-8 version. The beginning shows not the opening crawl, the cut version starts in space over Tatooine with the star destroyer attack on Princess Leias's blockade runner while a speaker summarizes the opening crawl. Almost three years later the German "UFA" released a 17 minutes long version including parts of the final battle against the Death Star and the throne room ceremony. Additional this version includes a lot of sequences not shown in the "marketing film" version: cantina scenes, Tusken raider scenes, the destruction of Alderaan, the Death Star approach of the Falcon after entering the Alderaan system. By editing this three reels together the viewer got a complete overview of the story. But Obi-Wans death is not shown. 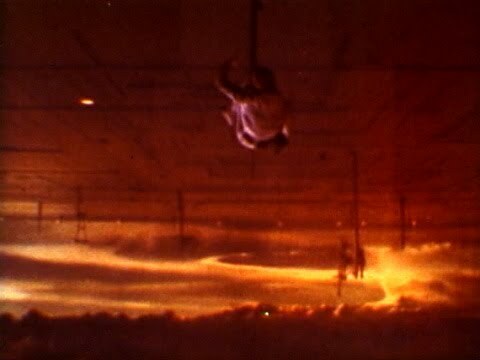 The 17 minutes US "Ken Films" version (F48) provides two scenes not included in the German version: Vaders conversation on the blockade runner and a part of Luke and Leias swing across the abyss. Editing this two scenes - copying the German audio track - into the "marketing/UFA"-3-reel-version provided the longest available cut version of STAR WARS: 43 minutes. 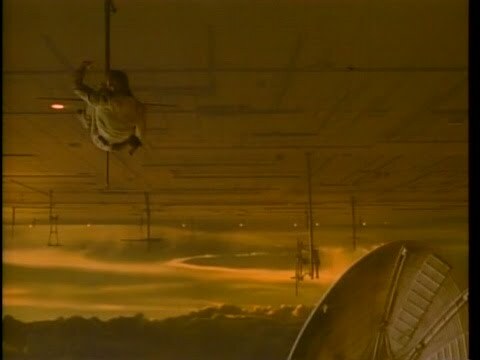 The weird thing about the frame of Luke hanging under Cloud City is not that the dish is absent, but the whole vane where Luke is hanging is in a different spot. "The new issue of the superlative smallformat magazine just arrived in my mailbox today. I'm thrilled to see that the magazine is continuing in its high quality coverage of small format filmmaking, and the stylish (almost explicit!) photographs of old movie making gear. This issue discusses the use of Super 8 and 16mm film aboard commercial airliners for in-flight movies. I've always wanted to learn more about this as I have airline prints of both Star Wars and Empire Strikes Back." Nice eye. Luke is a foreground element shot against bluescreen i guess, with the entire backdrop including the city being a matte composite. When the Falcon dish miniature element was added, the balance of the image was shifted, and so Luke was moved from a more central position to screen-left in order to balance the dish dominating on screen-right. Interesting finds all around. I haven't seen the Puggo editions but i am guessing that these are the only alternate-footage clips? Would be nice to also have stuff like the shot of Luke without the early AT-ST comp and the original bacta tank edit. The Secret History of Star Wars -- now available on Amazon.com! "When George went back and put new creatures into the original Star Wars, I find that disturbing. It’s a revision of history. That bothers me." I didn't notice any other visual differences aside from cuts that were made to shorten the movie. 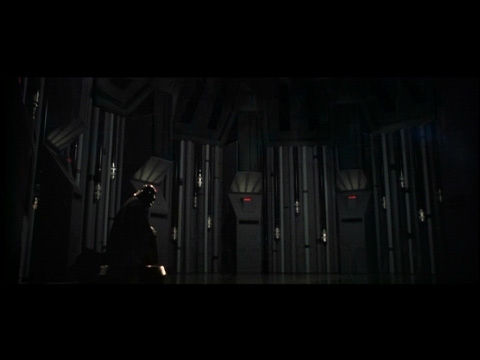 The bacta scene is not on the Super 8 reel and the AT-ST is not in the frame--the image is panned on Luke. I mentioned this in the Puggo thread: Of course, since it his heavily edited, not always razor sharp on the details and is pan and scan, we need to be extra careful when relying on it for differences. One of the things I hope someone could double check on is extra (or at least more pronounced lines of dialogue) of Lando talking to Han in the background when 3PO is cussed at by that other protocol droid in Bespin before he is blasted. The 8mm version had this bit of dialogue I didn't hear in the GOUT or the 2004 mix. Maybe it is there (like the "Fall back!" lines on Hoth) but just buried deeper in the mix. I would love to see the airline print of TESB that is mentioned over at retrothing! I have contacted one of the guys there to see if he is willing to deal. 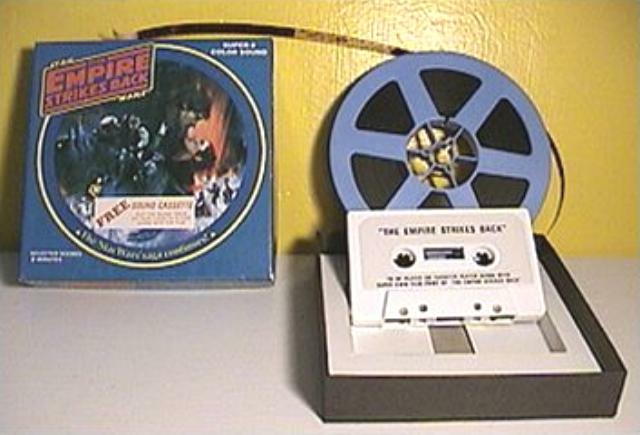 ** EDIT - I found this mention on another forum - "Curiously, in 1980, when Ken Films licensed THE EMPIRE STRIKES BACK for home movie use, not only did they release two different 400' reels from the film, but offered a 200' reel that was in sound...yet came with a cassette of the soundtrack for those who did not have a sound projector. I recently tracked down this obscure item for the collection at home. (Yes, I still play with the old projector.)" - I wonder if the tape is from the 35mm or 70mm release? I wonder if any of those 70mm film frames released in 1995 tell us any more? Ok, perhaps that one is a bit desperate. EDIT - Actually I think this is the entire run. I guess we will just have to wait and see if a pirate copy of TESB filmed from a 1980 70mm theatre run turns up. ----I wonder if any of those 70mm film frames released in 1995 tell us any more? Ok, perhaps that one is a bit desperate. ----EDIT - Actually I think this is the entire run. "The bacta tank scene starts on a close-up of Two-One-Bee and pans right to a closeup of Luke in the tank. It then cuts to FX-7 extending its arm to the tank. There is no cut to Leia, Han and Threepio observing." Isn't the 70mm mix on this line done by a different actor than the 35mm? Yes. Building Empire sez that Mark Hamill actually did one of the takes, but I don't know if it was for the 70mm or not. I believe it was indeed the 70mm mix in which MH does the "transport" line. You can hear it's him in the DVD release if my memory serves me correctly. I was watching Puggo's 8mm transfer again and I noticed the probe droid scene early on in the movies was in a different order than the released video version. Anyone know if this edit was unique to the 8mm or a remnant from the 70mm? I believe it to be particular to the 8mm version, though I have no proof. Ah, nothing like a trip to the dentist to give you an opportunity to rest up and watch Star Wars videos. So I've spent the afternoon revisiting the lists above and re-compiling them, checking, etc. One of the oddities I found in Puggo's Super 8 project was a bit of audio where Lando tells Han, “You want to know something, Han? You were right. It’s over-rated!” as C-3PO talks with the other protocol droid. I haven't heard this in any of the released versions, but there it was. And strangly enough, it matched the novelization. I'll post my new list of differences and such soon. OK, so I've recombined the two lists of differences here and put them in order of the movie. I also pulled out the video differences, left the unconfirmed ones in italics and seperated the categories of audio differences. • After the Probot lands and moves left, there is an optical wipe to the overhead shot of Luke on his Tauntaun. • After Luke wanders through the snow and falls face down, there is an optical wipe to Han instead of a straight cut. • In the snow battle scene, when Luke drops into the snow after throwing a charge into the Imperial walker, the AT-ST in the background has no atmospheric depth. It looks too close and small. 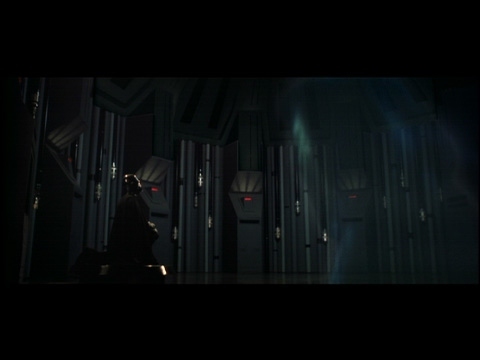 • The telepathy between Luke and Vader during the "Hyperspace" cue has straight cuts instead of quick dissolves. NB, these are items that are present in the 35mm mix, but are greatly dialed down under sound effects or the score. • On Hoth, right after C-3PO tells R2 to "Switch off," R2 gives out a little 'blurp.' More pronounced on the 70mm. • When Luke finally collapses in the snow, he lets out a grunt as he lands on his face. • When R2 is being loaded into Luke's X-Wing, C-3PO says the word "and" before saying "do take good care of yourself." The 2004 DVD really cranks up the quiet “and”. • Yoda says the word "Run!" before "Yes. A Jedi's strength flows from the force." The following lines "But beware the dark side. Anger, fear, aggression. The dark side of the force are they. Easily they flow, quick to join you in a fight" are also much louder and clearer. • While C-3PO is on Chewie's back when they enter the carbon freezing chamber, the line "Now remember, Chewbacca, you have a responsibility to me, so don't do anything foolish" is louder and heard more clearly. • Han says "until I can get the shelter up" instead of "until I can get the shelter built." • Luke says an additional "Ben... Dagobah..." just before Han says "and I thought they smelled bad on the outside." In the 35mm, apparently, we only hear Luke mumble when we can see his mouth. • When C-3PO tells Luke "It's so good to see you fully functional again," Luke replies "Thanks, Threepio." • Luke now says "This is it" just before his wingman (and soon, himself) is hit by AT-AT fire. His lips move, too, but I never noticed before. • Han's line "Transport, this is Solo. Better take off, I can't get to you. I'll get her out on the Falcon" is followed by, "Come on!" • Luke says "You're lucky to get out of there" instead of "You're lucky you don't taste very good." • Yoda makes a frightened "Ehhhhh!" sound just before Luke says "Like we're being watched" and points his blaster at him. • The Imperial fleet establishing shot after the magic tree scene has a different TIE fighter sound effect. • Cloud City Patrol - "Permission granted to land on platform 3-2-7. Any deviation from..." - Han cuts of comlink. • In Cloud City, after C-3PO says "That sounds like an R2 unit in there. I wonder if it..." he says "Hello?" only once instead of twice. • Before C-3PO gets shot, a different voice says "Who are you?" • During the duel, when Luke knocks Vader off of the platform, Vader lets out an "ooooh!" instead of an "aaargh!" • Lando's line at the end, "Luke, we're ready for takeoff." is a different take. • In the final scene, there is no tracked music from "Yoda and the Force".